One of the great pleasures of hosting this show is that I have an excuse to reach out to old friends and spend some quality time with them. And I get to double the quality time! I really love gettingto listen to the whole episode again. It's a time to dig in and figure out what the episode was really about, and write these essays. Originally I was going to have the episodes transcribed and then read them, but in episode 2, I heard a different perspective. Information Architect Abby Covert talked about how processing her own research transcriptswas essential to her work....I tried it, and she was right. It can be hard to give oneself the time for reflection and learning, even though our internal conversation is the most critical of all the conversations I've been researching (See David Whyte's The Three marriages for more on that!) In a few weeks I'll be sharing an episode I did on Meditation, one of the key tools to maintain (and silence, occasionally) a healthyinner conversation. Redesigning your inner conversation! Who wouldn't sign up for that from time to time? In this episode I talk with Rei Wang, Director of the Dorm Room Fund. Rei and I connected way back in my Design Gym days: I think we were running an innovation day for GOOD magazine where she was manager of GOOD Local. The workshop might have been around connecting with your neighbors? We stayed connected as she moved to General Assembly (where I taught UX part time) as she rose up the ranks and managed their rapidly growing community efforts. She now directs the Dorm Room fund for First Round Capital, and it's an amazing and unique organization. First Round does early investing in companies like Blue Apron, Birchbox and Warby Parker. And while the Dorm Room Fund is funded by First Round, it's run completely by college student volunteers, not professional VCs! This tight community of volunteers IS the Dorm Room Fund. I think there is a lot talk about community: about building it and trying to monetize it...but few people treat their community as an living conversation to be designed. In the opening quote I pulled, I was struck by Rei's perspective that companies develop better products in deep dialog with their communities. To some, this is obvious, but only those who cultivate their community consistently and with intentionality get to harvest insights and profit! 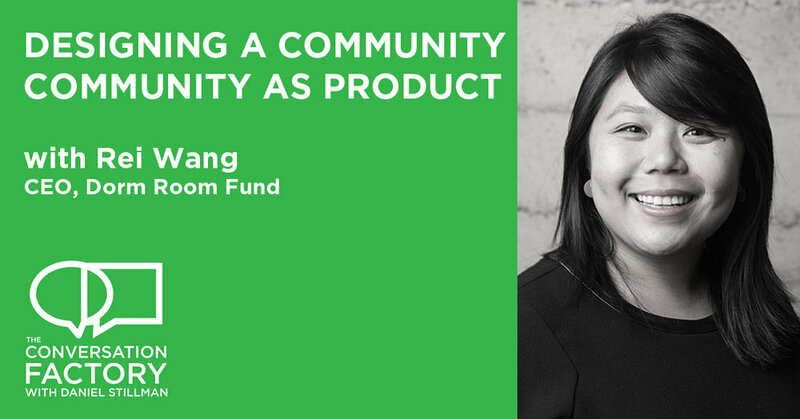 Community can be just for celebrating and marketing a product, it can be to have customers contribute to the product...but Rei sees her community *as* the product, which means she's very careful to orchestrate it's development and evolution. The volunteer students in the Dorm Room fund must have a high level of autonomy and drive, which means she has to pull the work out of them, not push it on them! And her community is rapidly refreshing, by design: Each year they lose people as they graduate and gain students who come in: Capability leaks out of her community constantly! Rei's solution doesn't seem to have a name, so I'll call it Cohort Mixing. In her annual event, she makes sure incoming, current and outgoing groups all connect in significant ways, in large and small groups and over time. This helps keep traditions and institutional knowledge alive and constant, even as the community renews. Thinking about your own company or product...how can community transform how you develop and test ideas? And how can you empower people in the community of your company to share and pull their own work forward, without you pushing every day? Enjoy the episode! Rei's insights are solid gold. No bonus tracks this time...Rei and I somehow got it all in under the bell! The Famous Designer who said internships should be paid!